When these first launched I had absolutely no intention of trying them, I don't often reach for a lip liner and the idea of having a built in lip liner in a slightly different shade was something I had no intention of having in my collection. However when they were giving this away last month with a magazine I knew I couldn't pass up trying it for a few pounds. They didn't have a lot of colour choice when I went to pick this up and so I picked the Revved up red shade as you can never have too many red shades, can you? I wont lie, I definitely only picked this up to test out and review as I was curious of the formula. 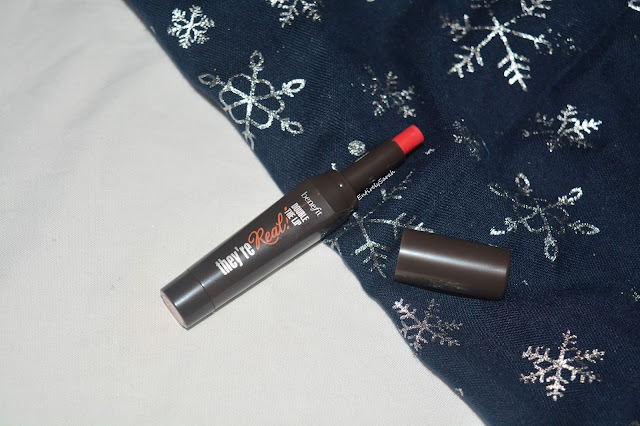 The product comes in a tall style tube which is a dark grey style colour, this is a nice tube and really mimics the look of the they're real mascara. The cap pulls off to reveal the lipstick which does twist down to be fully covered by the sides of the casing, which I like as it minimises accidents from when you go to put the lid on as you don't catch the product. The bottom of the product is where the twist mechanism is and it has a really easy, smooth twist action to twist the product up and reveal more of the product. The product is a lovely shade, one half is the liner which is the much more red side of the product with the lipstick part being the more pink tone shade. I was quite surprised by the shade of this lipstick as I expected it to be a really bright true red shade which would pack a punch on the lips and be a real pin up red shade. I feel this looks a lot more muted and pink toned on the lips and definitely not the red I imagined when I picked up this colour. When applied to the lips this is a beautiful shade, a little more on the pinker red side than the true red side, and so I am a little disappointed with how I thought this would look to how it did look. 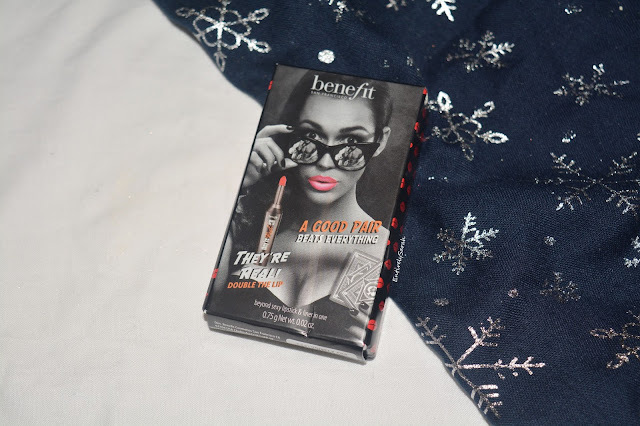 The lip colour applies really nicely and is such a lovely creamy formula which feels really comfortable on the lips. The creamy formula allows it to feel comfortable and non drying, while still being nice and opaque, however the non matte formula means it doesn't fully dry down and so you do experience transferring from this lip colour when you eat or drink, meaning I would want to reapply it when I was wearing it and eating or drinking. The lip colour didn't have the distinct line between the lip liner and the lip colour which I was worried it would have but I also feel like because I don't see any definition from this, its a bit pointless. In the photo above, the top swatch is just the lip liner side, the middle is them applied straight from the tube as normal, and the bottom one is just the lip without the liner. As you can see I don't really see a lot of definition between them and so I feel it is a bit of a gimmick in the bullet with not much purpose on the lips. 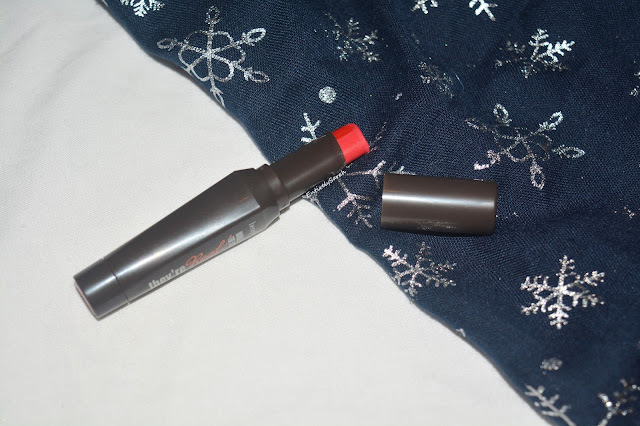 On the whole this lipstick looked lovely on the lips, it applies nicely and wear very comfortable, and while I do think the colour is lovely, it definitely doesn't scream red like the name suggests. While I do like the product, it is something I am glad I got a travel size of for free with a magazine and I didn't pay full size for as I don't personally like it enough to warrant buying a second shade for £16.50 as I think there are easier to use products for that price and formulas I personally prefer. I do feel like these are a nice product and one worth checking out if you have been eyeing them as something you feel will work for you, but I don't see me purchasing any more of these in the foreseeable future. If you want to shop these you can find them on Boots with all the shades here, where there is a range of shades and colours, but I would recommend trying them at a counter if you are a little on the fence but still think they are worth testing out. I would love to know what your current favourite lip product is, so let me know down in the comments and I will be sure to check it out!